Oil is spreading across the Gulf of Mexico -- the result of the sinking of an oil rig last week. A spill of this magnitude so close to the wetlands, estuaries and national fisheries of south Louisiana is unprecedented. Though it's unclear how badly wildlife along the Gulf Coast will suffer, the timing of the spill couldn't be worse. This is peak spawning and nesting season for many species of fish, birds, turtles and marine mammals. Many species remain in set breeding areas during this time and there's less instinct to move away from danger. Disturbances to nests, fish spawning grounds or key links in the food chain might have lasting effects on species already at risk, commercial fish stocks and the people who make a living harvesting them. Minor oil spills are relatively common on the Gulf Coast, but this one has biologists, wildlife agencies, conservation groups and fishermen particularly concerned. Here's a selection of animals at risk in the open water, along the coasts and in the wetlands. 1. North Atlantic Bluefin Tuna: The Great Bluefin Tuna, prized for sushi and sashimi, is one of the species most in danger of slipping into extinction. Traveling down across the Atlantic seaboard, bluefin tuna spawn in the Gulf of Mexico between mid-April and mid-June. 2. Sea Turtles: Five of the world's seven sea turtle species live, migrate and breed in the Gulf region. Kemp's ridley is the world's most endangered species of sea turtle, and one of its two primary migration routes runs south of Mississippi. Loggerhead turtles, also endangered, feed in the warm waters in the Gulf between May and October. 3. Sharks: Shark species worldwide are in decline. The grassbeds south of the Chandeleur Islands are very close to the oil spill. These grasses are a known nursing area for a number of shark species, which are now beginning their spawning season in the Gulf. Whale sharks, the world's largest fish, feed on plankton at the surface of the water and could also be affected. 4. Marine mammals (whales, porpoises, dolphins): Oil spills pose an immediate threat to marine mammals, which need to surface and breathe. Not only does the oil pose a threat, but also the nasty toxins that the oil kicks off into the air. A resident pod of sperm whales in the spill area could be at risk along with piggy sperm whales, porpoises and dolphins. 5. Brown Pelicans: The state bird of Louisiana, the pelican nests on barrier islands and feeds near shore. Brown pelicans only came off the endangered species list last year, but they've had a rough time in past seasons with storms. Their reproductive rates are low. 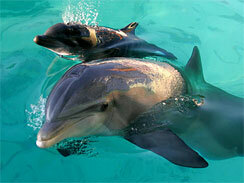 Breeding season just started, and with eggs incubating the oil could pose a significant threat. Click here to find out the next five animal endangered by the oil spill.